Note: To make things easier and ensure that the New Edition launched in time, we figured it would be best to send standard questions often given to the folks we interview. We received the answers in due time, but any follow-up questions we may have had will be updated as time goes on. 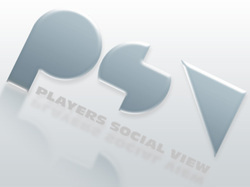 Who are Players Social View? A networking website for gamers of all systems. How did the PSV get started and where did the idea come from? I was hired shorty after the launch of the site so to be honest i'm not sure!! Is there a constant goal behind the company? What are you guys setting out to do? yes we have many goals,to many to list.basically we are networking gamers with entertainment and info that normally you would have to visit multiple site's to retrieve.PSV is the one stop shop for gamers.like blogs,forums,trailers from u tube,game facts,home news on events and much more. Currently, what is the focus behind PSV? Are you guys more focused on photography, gaming in general or Home film production? Like i said,PSV is the one stop shop.we are doing all the above and much more.We have directors in all departments with assistants to ensure every department is running smoothly and being updated daily.For instance i am the decorator director.I am in charge of the filming department.Acting staff and casting for actors/actress's.I also help promote in home. What does the team normally do in Home? Hang out in clubhouses, play games, just wander? well we were founded and based in home from the beginning.The website came afterwards. Are there any other social networks or websites our readers can find Players Social View? Yes, Face Book,u tube and twitter. What does the team plan to accomplish in the future? Are there any upcoming ideas or endeavors that you guys are planning? Everything we can think of to help gamers get info and keep them entertained and connected wile doing so.We are currently working on many reality TV shows for our U tube channel(PSVisionsCrew).we are also working on a website just for PSV productions so we can separate our tv shows from our u tube links.Basically you'll subscribe to our site to watch our vids.all shows will play once a week like a real show.thats what i can tell u about my department,Filming. If you could pick one space in Home to stay stranded on for the rest of your life, what space would that be and why? hmmm hard question!! !Wanna say central plaza but it's gone..and i used to luv playing pool<But they messed that up and i hate it now! !so i guess the midway. The goal of PSV is to become the centralized location for gaming news and entertainment on the web and on PS Home. The focus behind PSV is variety; there are many different things many different people are working on. With that said however, the best focus is on the brand itself; building a reputable company that all gamers and PS socializers know and trust. PS Home is convenient for company conference calls, sharing ideas, and of course hanging out together. We heard about the company's recent travels to other consoles and online platforms. When and why did the team ultimately decide to expand? Someone will give you a better answer than I can for this question, yet I'd say leaving am imprint on all platforms is vital to any gaming company. I would choose to stay in a clubhouse with friends. Company you can trust is company you should always keep close to you. Is there anything you would like to say to our readers and your fans? It was started in early January and Jasmine was talking about making a site for gamers so we all encouraged her to make a social network site. Yes are goal is to have our site become one of the best gaming sites because we are trying make films do a little modeling it's a lot of things we are trying to do. Currently what is the focus behind PSV? Are you guys more focused on photography, gaming general or Home film production? Our focus behind PSV is to keep our users informed with upcoming info and latest news on upcoming games. as of right now we are focused more on film production because we are trying finish up on some of our projects. What does the team normally do in home? Hang out in clubs, play games just wander? We have our meetings on home since we are all in different locations, and we wander around on home just to speak on the site or to find other locations on home so we can film or do photography. We made the decision to expand to other platforms a month or so after the site was launched only because everyone does not have a ps3 console so we wanted to make the site for everyone with different game consoles. we have a fan page on Facebook and we have a twitter page as well. What does the team plan to accomplish in the future? Are there any upcoming ideas or endeavors that you are planning? If you could pick one space in Home to stay stranded on for the rest of your life, what space that be and why? The space I would pick will be the Loot Space Station apartment, because I've always wanted to see what space looks like in my own eyes. To all the fans I would like to thank you all for having so much satisfaction in what we are doing for you all and we will continue to keep growing and making all of you happy and we hope you continue to spread the word about our site. PSV got started when Jay wanted to make a social site for the gamers. When I went to visit her at her place on PlayStation Home, I was on the PlayStation Blog site telling about upcoming items for Home. Then she told me her idea about the website and she told me that I can keep people informed about what is coming to either on Home or in the PlayStation Store. Our goal is to have everything there is about gaming all in one place. Instead of having to go site to site to find the right information, we put it all on one site so gamers don’t have to spend time looking for the information. Our focus is basically all around. We have an original film that we made called Home Nation and also we are currently making a music video. We also focus on gaming as well. We tell about upcoming news about new games or game rumors. We basically just wander around home. Some of us promote the company either by word or by the activity board. In addition, we do events that people can participate in. We started to expand not long after we beta tested the website. We thought that it cannot be just for just PSN users for this site since there might be some users that might own more than just the PS3 (like owning an Xbox 360, Nintendo Wii, PS Vita, etc.). So we decided to expand our audience to include other gaming platforms instead of just being PS3 only news. We hope that we become a successful website and don’t end up being a one hit wonder. Right now we are just doing original Home filming and hopefully we can expand more for our fans in the future. I would like to say to the fans of the site thank you for being part of PSV and to your readers to please sign up if they haven't done so. If they did sign up on our site, then i say thanks to them as well. And also make sure they spread the word about our site as well. Its a Social Network for gamers. PSV had started in January of this year. They came to me if I was interested to join PSV as a Dj. I thought it was a great idea. I never heard of a gamer social network. Pretty cool! All of above. We do most of everything. We hangout, Have our weekly meeting every week. Well I know some other people play X-Box, Wii,& PC games besides PlayStation 3. My opinion I think everyone can get there information in one website & Socializes with other gamers at the same-time. This weekend (June 2nd) PSV is having a Celb-Look-Alike contest. Also we having a Ultimate contest coming soon. I would say the Tropical Escape because I LOVE WATER and i love how its set up. Very nice!